CCOs are managed care organizations that care for Medicaid members under a fixed global budget. Using networks of local providers, they provide integrated physical, behavioral, and dental care – emphasizing care coordination, wellness, and chronic disease management. A portion of capitation is held aside to reward CCOs for achieving specific health outcomes and quality measures (). Oregon received approval for the CCO 1115 demonstration waiver in July 2012. According to OHA, since its implementation, the coordinated care model has improved access to primary care, reduced costly Emergency Department (ED) visits, and saved the state an estimated $2.2 billion dollars in avoided health care costs. Nearly 88 percent of Medicaid members are enrolled in a CCO. With the current contracts expiring on December 31, 2019, Oregon is seeking to procure new contracts to run from January 1, 2020, through December 31, 2024. These new CCO contracts, worth approximately $4.5 billion per year, will focus on prevention, improving quality, accountability, eliminating health disparities, and lowering costs. Under CCO 2.0, CCOs will also be required to address Social Determinants of Health and Health Equity (SDOH-HE) by directing a portion of spending on SDOH-HE and ensuring their work with community partners addresses community priorities. Additionally, the model will expand value-based payment (VBP) arrangements with contracted providers through more rigorous performance metrics and expectations, as well as expand Patient-Centered Primary Care Homes (PCPCH) success by supporting Behavioral Health Homes. In addition to covering Medicaid eligibles, CCOs will be required to enter into a companion contract covering state-funded services. For example, in 2019, CCOs participated in Cover All Kids (CAK), a separate CCO contract covering children up to age 19, not eligible for traditional Medicaid. This requirement lays the groundwork for CCO involvement if the state decides to implement a Medicaid-buy in or public option program. CCOs planning to serve multiple areas can submit separate applications for each of the service areas, or a single application for multiple areas. Mandatory letters of intent will be due February 1, 2019, with final applications due April 22, 2019. Implementation will begin January 1, 2020. The state has a total of 15 CCOs serving nearly 840,000 Medicaid members as of end-of-year 2018. 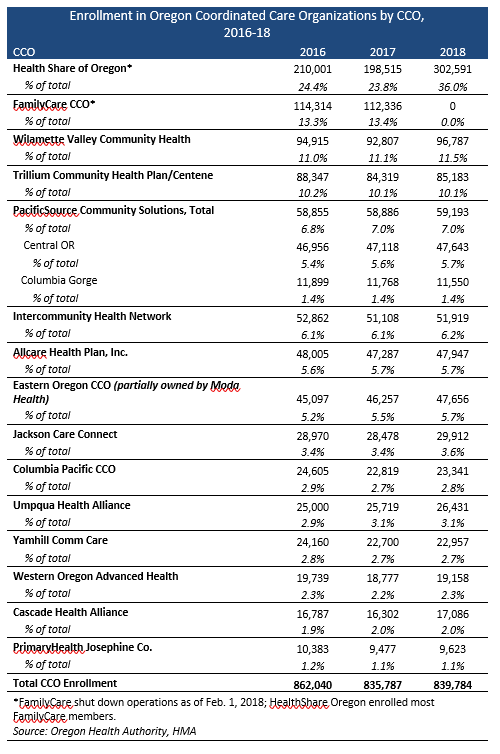 The largest CCO is Health Share of Oregon. Prior to February 2018, the second largest CCO was FamilyCare, which closed after heavy losses and a long running dispute with the state over rate adequacy.